Thick ocher pigment runs along the left and right edges and is more concentrated towards the upper half of the composition, leaving the work's center and most of its bottom half unpainted. A yellow lifeline, applied directly from a tube, runs from the top center down towards the bottom center, where it tapers off into nothing. A tiny red dab is placed in the bottom left quadrant. 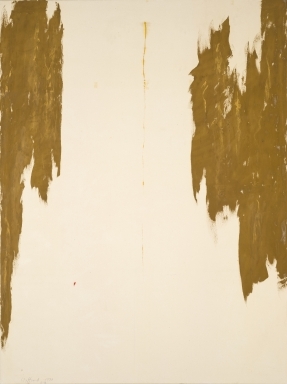 Clyfford Still, PH-713, 1970. Oil on canvas, 88 3/4 x 66 1/2 inches (225.6 x 168.9 cm). Clyfford Still Museum, Denver, CO.